A morning lecture (10:30am to 12:00) will cover the basic chemistry and physics of papermaking while including perspectives on a variety of methods and techniques. In addition Mike will dive into an overview of natural dyes and pigments. We will break for lunch from 12:00 to 1:00. Then after lunch from 1:00 to 5:30pm, we will put it all to work and make paper. Hint: It’s a wet process, a very wet process. So wear sandals, river shoes, or plan on going barefoot, you might also want to bring a waterproof apron. What? You don’t have a waterproof apron…no worries we will provide you with a stylish contractor bag! This is a hands on workshop. Participants will go home with the paper they’ve made. But that’s not all! everyone goes home with a mold, a deckle, and the set of felts that the wet sheets are transferred to. 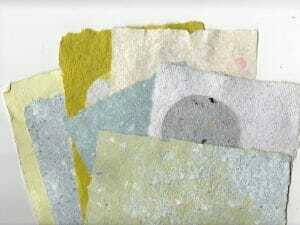 It’s a workshop to get you stated with the art, craft, and science of papermaking. The requirements and set-ups for both home studios and more professional settings will be discussed. Tuition is $160.00 for the day and includes the basic tools and materials. Organic lunches are available through our Culinary Department for $15.00. For those who would like to spend the night or weekend with us, check in with our Welcome Center regarding rates for rooms and campsites at 707-923-5000.